When Bugatti introduced the Grand Sport Vitesse La Finale, the "last production unit" of the supercar, at the 2015 Geneva Motor Show, I honestly believed it would be the last Veyron to emerge from Molsheim. As it turns out, I was wrong, as a bespoke model delivered back in January just surfaced in the Interwebs to steal the show. It goes by the name Veyron Grand Sport Vitesse Cristal Edition and was created for a Chinese collector who commissioned it for his girlfriend. There’s nothing wrong with that, as long as you fancy pink accents on a supercar. 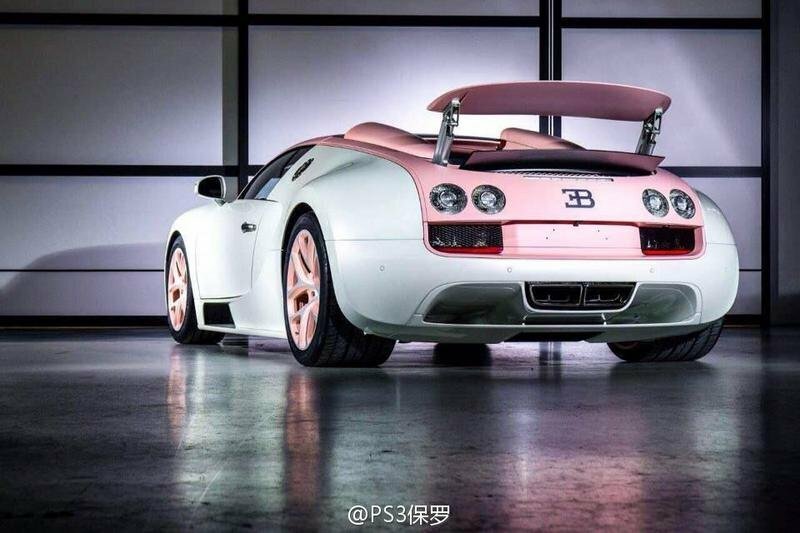 Yup, this Veyron was wrapped in a two-tone, white-and-pink livery, which is probably why Bugatti didn’t bother to issue a press release or give it a proper introduction at an automotive event. With most Veyrons linked to classic Bugattis one way or another, I can understand why the French opted for a quiet delivery. On the other hand, the Cristal Edition isn’t the first pink Veyron to roam the streets, but more about that in the detailed review below. Continue reading to learn more about the Bugatti Veyron Grand Sport Vitesse Cristal Edition. The other two I know belong to Flo Rida and Katie Price, and both are the result of aftermarket shenanigans. Unlike recent Veyrons built as tribute cars to classic Bugattis, the Cristal Edition doesn’t feature any special logos or badges except for the pink "L" on the fuel cap. Its livery, on the other hand, is unique, mostly because the white body panels are complemented by pink-painted roof pillars, engine cover, rear wing, rear fascia, and wheels. 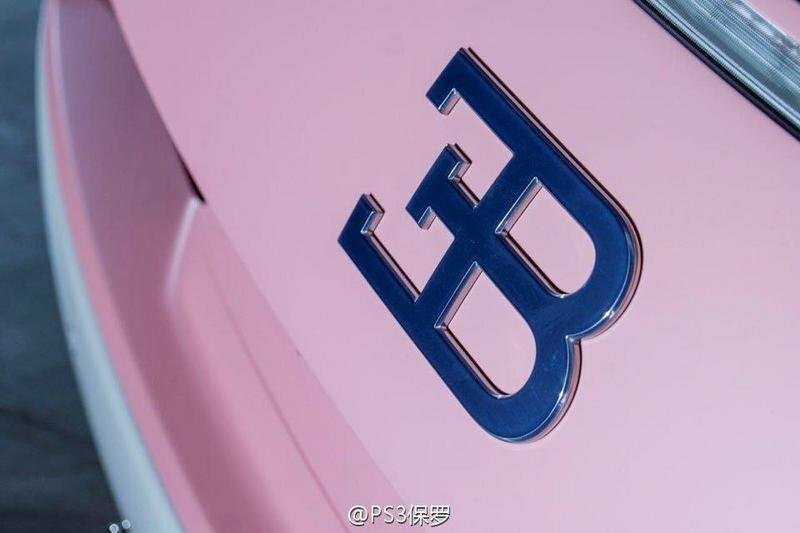 Although this might be the first factory Bugatti to feature pink body elements, it’s certainly not the first Veyron to wear the color. The other two I know belong to Flo Rida and Katie Price, and both are the result of aftermarket shenanigans. 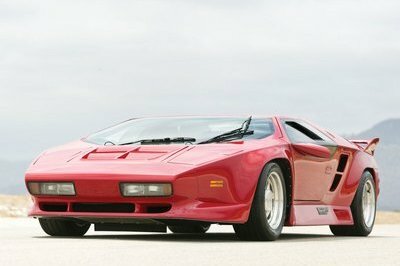 While I’m not particularly fond of pink cars unless they’re Hemi Cudas or Roadrunners, I must admit that the Cristal Edition is rather tasteful compared to Flo Rida’s all-pink supercar. Still, with this color commonly associated with sensitivity and romance, I find any pink supercar out of place. I still approve the Moulin Rouge Mopars of the 1970s, so don’t start any rumors about me being hard-hearted. It looks like the kind of interior the Pink Panther would design. The pink theme continues on the inside, making the interior even more obnoxious than the exterior. There’s bright pink leather on the dashboard, center console, seats, the floor and the steering wheel, with a lighter shade of pink on the door panels and the center console. It looks like the kind of interior the Pink Panther would design. 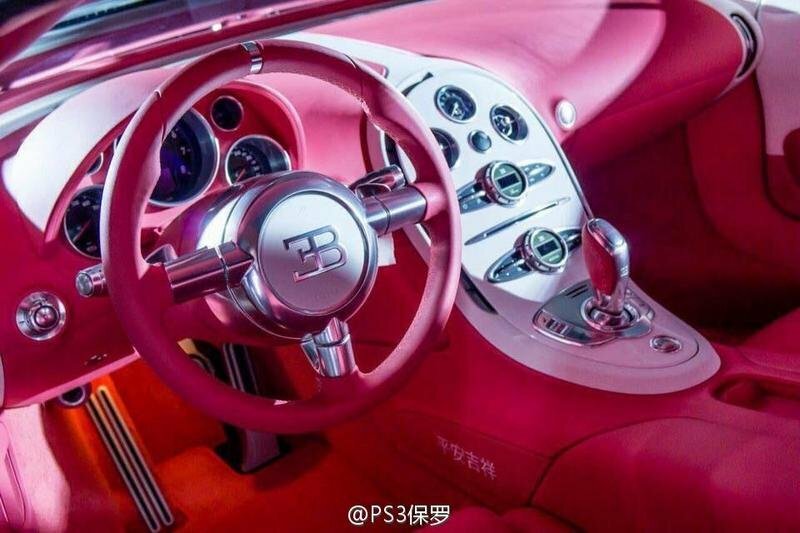 Those that have the power to ignore the eye-stabbing pinkness of the cockpit will probably notice this Veyron also benefits from Bugatti’s flawless fit and finish, as well as the company’s numerous hand-crafted features. 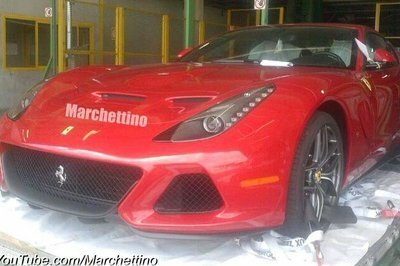 Highlights include contrast stitching on the gear shifter, Chinese lettering embroidered on the center tunnel, plenty of white and chrome accents, and bespoke side sills with "Cristal Edition 1 De 1" lettering. 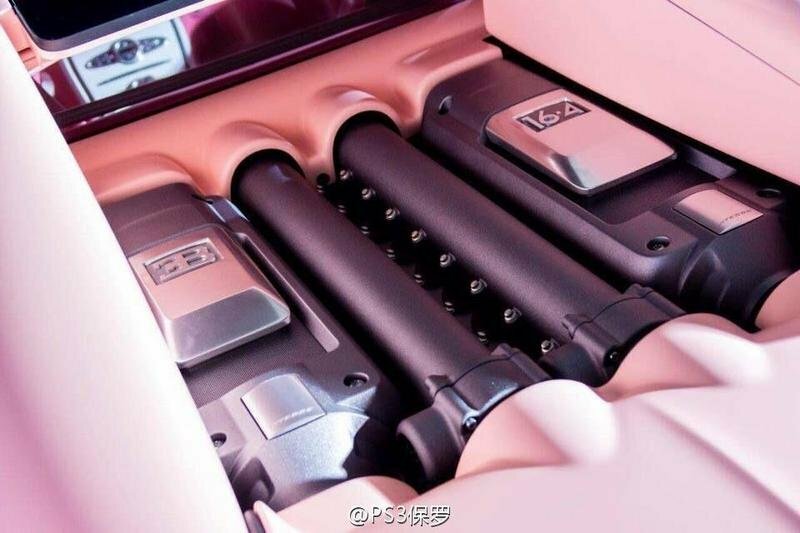 As with all Veyron Grand Sport Vitesse models, the Cristal Edition carries a standard Veyron engine under its pink hood. 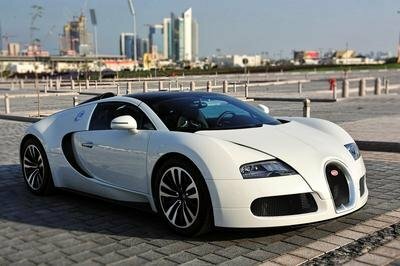 But Bugatti’s only engine for the Veyron is far from ordinary, as the W-16 displaces 8.0 liters and churns out a whopping 1,183 horsepower and 1,106 pound-feet of twist. All that power and torque travels to the four wheels through a seven-speed, DSG sequential gearbox, and the performance it delivers once it hits the pavement is downright amazing. The 0-to-60 mph sprint takes only 2.6 seconds, while top speed is "limited" to 233 mph. 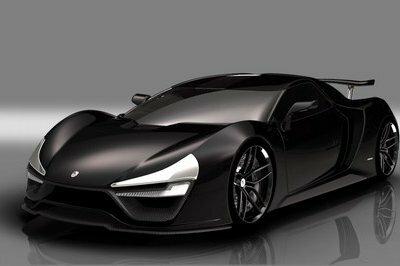 With the limiter off, the Grand Sport Vitesse can hit 254 mph, which is a Guinness Book record for production roadsters. It’s common knowledge that Veyrons don’t come cheap. Bugatti’s recent "Les Legendes de Bugatti" models carried stickers in excess of €2 million, which converts to around $2.15 million as of 03/19/2015, and I have a hunch the Cristal Edition was by no means cheaper than that. 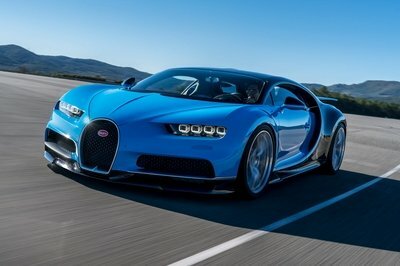 The good news about the Grand Sport Vitesse Cristal Edition is that it comes with all the insane power and torque the Veyron has to offer, as well as the privilege of driving the world’s fastest convertible. Obviously, its downsides are the pink body panels and the two-tone pink interior, while also missing the numerous bespoke features seen on other one-off Veyrons. I admit it, I am biased, and yes, I find the Veyron downright horrendous in this livery. 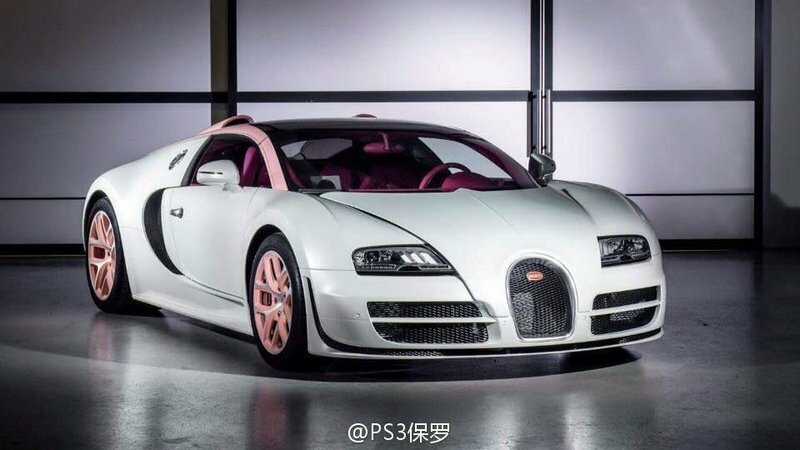 Yeah, it’s a better option to Flo Rida’s "triple pink" Veyron, but it still wears one of the silliest paint jobs ever seen on a Bugatti. Nice Valentine’s Day present, though.